There are only four Balearics Islands, located between Spain and the North African coast, and they all have their own characters. Between them they appeal to a very wide range of travellers and consequently offer a massive range of accommodation. Our selection of the best places to stay in the Balearics range from off-the-beaten-track farmhouse B&Bs to all-singing-all-dancing five star luxury hotels. Mallorca is the largest island and has a little of everything, from stunning natural beauty to elegant or bustling resorts, to traditional old manor houses done up as refined rural retreats. One of the main reasons Mallorca is a favoured Mediterranean destination is the coastline - it's breathtaking. And while resorts have colonised many a gorgeous cove, there are still plenty to be explored. Menorca is the tranquil island, yet also the one with the most unique landscapes to explore - there are biosphere reserves, national parks and curious archaeological sites. Menorca is where you'll find untouched beaches and coves. Ibiza: you only need the name to conjure up an image of clubbers raving all night. But if you go beyond the throbbing party scene, you'll find that Ibiza has a peaceful side too. A side of clean, sandy beaches perfect for relaxing or for watersports, dramatic cliffs, traditional whitewashed villages, hippies and World Heritage Listed sites. Formentera is the smallest and most southerly - and there's no airport and it's quieter. Formentera has unspoiled sandy beaches, the island is pretty flat, so it's a nice place for families, but there's not much in the way of cultural attractions. Outside the busy season the small independent hotels offer some great deals and there's more of a back-to-nature feel. If you want beaches then Menorca is unmissable, with more beaches than both Ibiza and Mallorca combined. The resorts are smaller too, so there are fewer people to share you stretch of beach with. We all know Ibiza is unmissable if you want to dance until dawn, but it’s also a fantastic destination if you want history and want to stay in a rural agroturismi or a homely finca. Even the capital, Ibiza Town, has medieval mansions, a cathedral, a castle and the Heritage Listed old town. If you want want to sail, fish, snorkel and stroll then Formentera is unmissable too. With such a breadth on offer, finding one of the best places to stay in the Balearic Islands shouldn't be too difficult. Here are our favourites. The Hotel Villa Italia is perfect if you're planning a sophisticated seaside break. Right on Port d'Andratx, a beautiful natural harbour, you're close to the smart restaurants and upmarket boutiques of this charming fishing-village-turned-high-end-resort. The best place to stay in Palma if you want to get close to its Roman history is the Palacio Ca Sa Galesa - its spa is a genuine Roman bath! Decorated with antiques, it also has a modern art collection - including a Miro and a Calder. One of the best places to stay if you're looking for a prime, Old Town location. Ten minutes walk from town, harbour side Portixol has a large restaurant-side pool and free bike hire, which makes it a good choice for families. The music lounge and huge selection of magazines and papers make it somewhere it's nice to hang out. For something historically Mallorcan, try Can Cera in Palma, a beautifully renovated and restored 12 room townhouse. The rooms are large and romantic and the suites have private balconies. The restaurant is fantastic and the views from the roof terrace are stunning. Rooms start from around £150 per night. Biniarroca Country House Hotel is perfect if you're looking for somewhere to hideaway. There are delightful gardens and a lovely pool. The rooms are stylish and the food delicious and either grown on site or sourced locally. It's also adults only, so ideal if you want to escape the family vibe. Sant Joan de Binissaida is a great choice for foodies. Firstly you're surrounded by olive groves, secondly much of the produce comes from the hotel's garden, and thirdly there's a Michelin star menu. Rural, but with every comfort catered for, Hacienda Na Xamena is one of our recommendations for those who want to get away from everything and just relax. The hacienda's setting is private - surrounded by pine forests on one side and a beautiful cove on the other. Infinity pools take full advantage of the views. The food is good and the spa even better. And, if you're looking for somewhere romantic to possibly spend your honeymoon this secluded spot is one of the best. Overlooking the marina, the Hotel Ocean Drive ticks all the right boxes if you want to be right in the heart of something lively! The decor is retro but modern and there's an excellent roof top terrace. The Hotel Es Mares is a peaceful haven of tradition. Local colours and textures, plenty of sun and bleached wood and Mediterranean deliciousness. There are 18 rooms - but no kids - and all the modern conveniences you need with no fuss or nonsense. 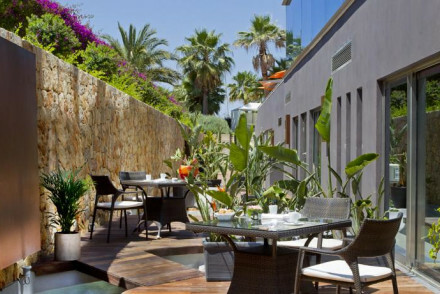 Hospes Maricel is a dream of a hotel sitting right on the Mediterranean at Carretera Andratx. The restaurant on the sea terrace is something special - it has Spain’s best Japanese chefs. As is the spa occupying the sea caves under the hotel and the infinity pool flows right into the sea. Between beautiful Sóller and picturesque Deià is the Ca’s Xorc, a truly special boutique hotel with 15 rooms and panoramic views from its sprawling, romantic terraces. The food is gourmet and the pool is an infinity. Font Santa is a five star hotel within striking distance of what many say is Mallorca’s best beach. This sandstone house has been beautifully converted into a 25 room hotel with chic, contemporary all white decor. There’s a great spa in the picturesque grounds. Barcelo Formentor in Puerto de Pollença is an idyllic beach resort with two pools, a choice of restaurants, tennis courts, a spa and beautiful tropical gardens. A large hotel set apart by its excellent sea views, Mallorca’s Es Molí is a good choice if you're looking for somewhere with a private beach. It's far enough away from Deia that this 17th Century manor house feels like itt has the island to itself - but you're actually quite close if you want to be. 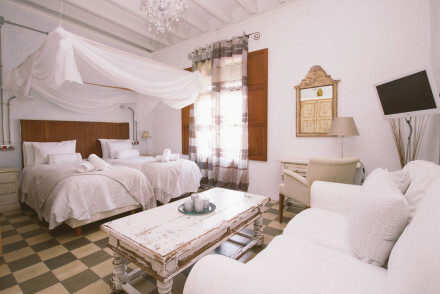 The Cap Vermell Beach Hotel is a charming, beachside hotel hidden way on the north east coast. There are just 12 simply furnished rooms overlooking the turquoise Mediterranean, plus a great seafood restaurant. If you want to relax in luxury stay at Mallorca’s Cap Rocat, a former military fortress converted into a secluded, relaxing, gastronomic resort. Cas Comte Petit Hotel & Spa is a luxurious, adults-only hotel in the traditional Mallorca town of Lloseta. There are just 14 rooms, a fantastic roof-top terrace with pool, an excellent restaurant and a spa that’s good enough to be part of the name. 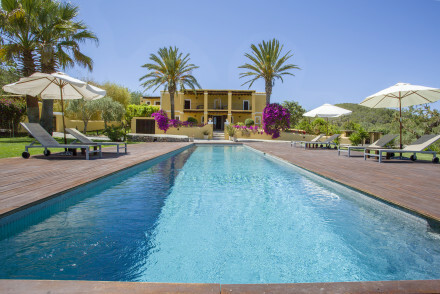 Sant Joan de Binissaida is a renovated Menorcan farmhouse offering chic accommodation as well as a Michelin-starred restaurant serving Mediterranean gastronomic classics. Relax by the pool or wander around the lovely gardens, which is where they grow many of the vegetables used in the cooking. If you're looking for a superb agriturismo, Can Talaias is one of the best on the Balearic Islands. It was one of Ibiza's first, located just above the village of San Carlos. There are excellent sea views, but you're not actually on the beach - though there are a number of peaceful coves and beaches just a short drive away. Torralbenc boasts a collection of contemporary farmhouses surrounded by grass plains. Modern minimalist accommodation, a spa and all the other necessary mod cons make this a great choice for a rural getaway. Can Pujolet is an agriturismo with superbly atmospheric accommodation featuring exposed wooden beams and warm hues. Lounge by the pool and enjoy meals made from locally sourced produce (some of which is even grown onsite). The Hotel Esplendido is the perfect base for a family beach holiday. In beautiful Sóller, with a private beach and extensive pool, spa and grounds, there’s plenty to do and a lovely sea-facing terrace to enjoy meals al fresco. Finca Es Castell is an off-the-beaten-track rustic retreat which is a haven for couples, families or groups wanting a relaxing rural retreat with great food. Situated in the heart of Mallorca, it's well positioned for exploring all over. 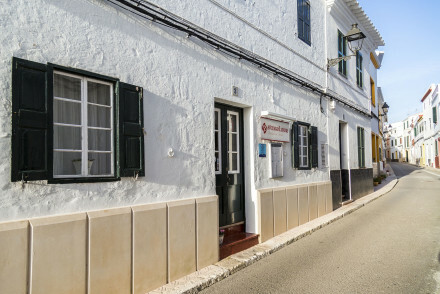 Located in the oldest part of Mahon, Casa Alberti offers an apartment (sleeping up to four people) as well as a range of unfussy rooms and suites - perfect for family getaways. Enjoy breakfast each morning in their charming courtyard to set you up for the day. Biniatram is set in the countryside a mile away from the beach at Cala Morell and offers simple, clean rooms with a lovely outdoor swimming pool. What's more, self-catering accommodation (apartments with kitchens) is available for families and groups. Mallorca’s main airport is Son Sant Joan airport, which is just five miles from Palma, Ibiza Airport is just four miles outside Ibiza Town and Menorca Airport, also known as Mahon Airport, is located 5km southwest of Mahon. It’s easy to ferry hop between the islands, and, depending which island you’re aiming for, it’s about an eight hour ferry crossing from mainland Spain. In winter only Mallorca is properly connected, though during summer there are plenty of flights on offer. The Balearic’s Mediterranean climate means there’s around 300 days of sunshine, and year round average temperatures of 20-21ºC. Summer is the most popular time to visit, but spring is possibly more lovely, what with the wild flowers and the fiestas - and the pre-peak-season prices. Many hotels and restaurants close between November and February, but the weather is still good in September and October. it’s definitely worth looking into the weather conditions around your accommodation choice - there can be quite a bit of variation. The best places to stay on Menorca? Or the best places to stay on Ibiza? 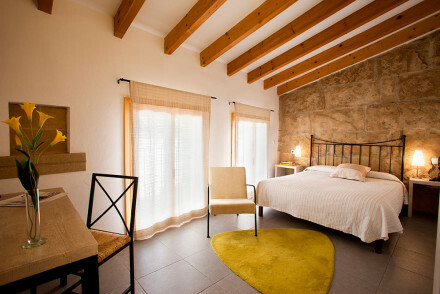 A charming rural agroturismo with ten individually designed rooms that ooze rustic charm. Think exposed beams, colour washed walls and tiled floors adorned with quirky objets and period furnishings. Breakfast is a lavish treat and there's a pretty garden and inviting pool to while away the days! 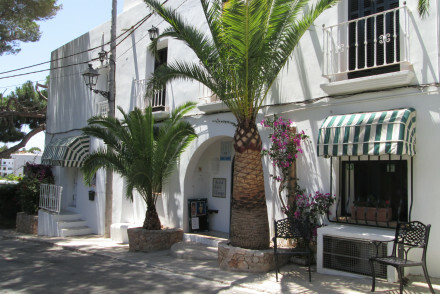 Vara de Rey guest house offers traditional and charming accommodation in Ibiza's historic centre. Make the most of the great location to explore the town, or wander down to the beach and take it easy. A friendly and utterly charming stay, without the killer price tag! A contemporary hotel on the beautiful island of Formentera. Chic rooms are white on white with plenty of glass and modern minimalist furniture. Featuring a lively bar, large swimming pool and exemplary Mediterranean restaurant. A trendy spot for an island break. Beach Life - A luxury property just a short distance from the famed Formentera beaches. The yang to Ibiza's yin, Formentera is a world away from its hedonistic big brother. Designed using colours and materials of a traditional finca, rooms are awash with white and sun bleached wood, yet in a much more modern style. The menu is mediterranean with lots of local fish. A haven of chic! Sailing - Take a boat out to the midst of the turquoise blue waters surrounding Formentera and some of its secluded bays. Sights nearby - The island of Ibiza is just a short boat trip away. 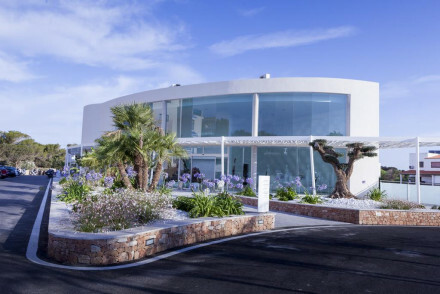 All round one-stop 5 star contemporary eco hotel with sublime food created by award-winning Michelin star chef Sergi Arola, pampering spa and rooftop pool overlooking Santa Eulalia marina. Will appeal to couples, soloists and groups who appreciate impeccable service, delicious food and good vibes. Eco break - The ideal eco break on the beach, with solar panelled balconies and sleek features to minimise use of AC. Total relaxation - With an award winning spa, pillow menus, a Michelin star chef and sea facing suites and rooms.